During my very first year in PR and marketing, all that I had in my arsenal of resources was the knowledge that I had gleamed from internships and the design, writing and pitching skills that I had taught myself through running That Working Girl for just over a year at that time. Now when I look back, I wish I had delved into the great blogs and websites available to women interested in breaking into the media and communications industries! 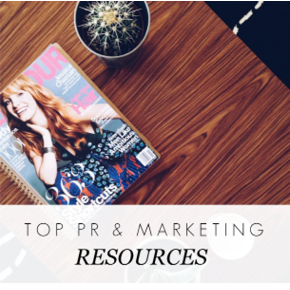 I don't want you to have to do all of the digging, so feel free to click through and enjoy the below invaluable resources that will assist in helping you navigate your first overwhelming, crazy, rewarding and exciting year working in PR and marketing. • PR Couture – Launched by fashion PR maven Crosby Noricks, PR Couture is the ultimate resource for ladies working in fashion, luxury or boutique public relations. • NYC PR Girls – A longtime favorite, NYC PR Girls is a no-nonsense PR blog penned by two ladies living the PR life in Manhattan. The blog welcomes reader mail and frequently answers great questions about working in the industry, lending helpful insight to PR newbies. • ProfessionGal – ProfessionGal is a great resource for anyone embarking on their first career journey. I particularly enjoy the Culture section of the site, which helps us keep up-to-date on all things on-trend. • Daily Worth – Before reading Daily Worth, I was never even slightly interested in learning more about how to manage my finances. To me, if I had enough money in checking to pay rent and enough in savings to serve as a good emergency fund, I was happy. However, after one visit to this site I was ready to learn about investments, IRAs and more. Even if you're in your first job, it's never too early to begin building your financial future!